Markovnikov's Rule: Why Does It Work? Let’s assemble all the facts we know about the reactions of alkenes with an acid like HCl so far. 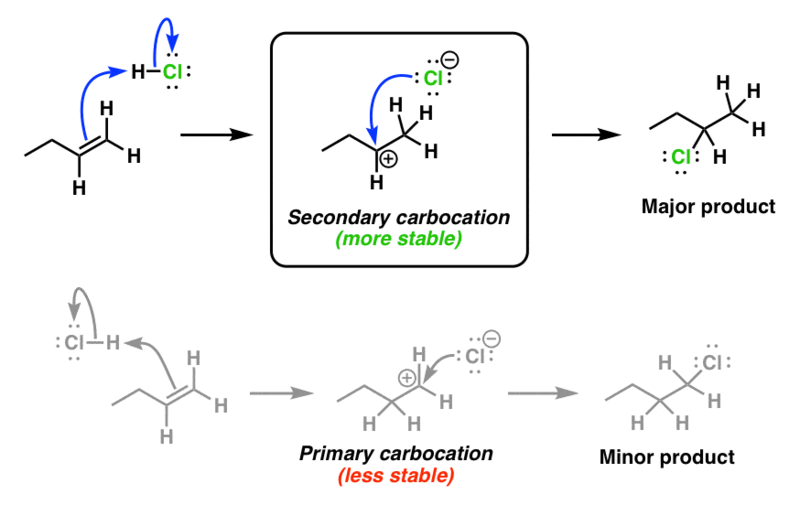 Regiochemistry: as we saw in the last post, reactions of alkenes with acids like HCl follow Markovnikov’s rule: the major product formed is that where the hydrogen adds to the carbon containing the most hydrogens. Stereochemistry: as we saw in the stereochemistry post, this reaction provides a mixture of “syn” and “anti” products (when the reactant makes this possible). Rearrangements. The last post briefly touched on another issue. In some cases, the reaction of alkenes with acids like HCl can lead to rearrangements such as hydride shifts or alkyl shifts. So how does this reaction work? Any mechanism we propose would have to be consistent with all of these facts. Furthermore, we need to think about this reaction in terms of what we already know about electron flow. Electrons flow from areas of high electron density (“electron rich”, or “nucleophilic” areas) to areas of low electron density (“electron poor” or “electrophilic” areas). Remember how electrons are polarized in a molecule like H-Br ? Hydrogen is less electronegative, and therefore more electron poor. Bromine is more electronegative and therefore more electron rich. In an alkene, the relevant electrons we will consider are in the π bond, which form a kind of “π electron cloud” above and below the plane of the alkene. Here’s the best hypothesis we have on how this reaction works so far. In this reaction, electrons flow from the electron-rich carbon-carbon π bond to the electron poor hydrogen. [Step 1, arrow A] leading to breakage of the H-Cl bond (arrow B). [Recall that this isn’t such a bad state of affairs for Cl- as it is a weak base and therefore a good leaving group]. This forms an intermediate carbocation, which is then attacked by the chloride ion (Step 3, arrow C) leading to formation of the alkyl halide. Why does this hypothesis fit with the data? Regioselectivity. As we saw in the last post, reactions of alkenes with acids like HCl follow Markovnikov’s rule: the major product formed is that where the hydrogen adds to the carbon containing the most hydrogens. This is consistent with the carbocation model, since carbocation stability increases as hydrogens are replaced with carbons. 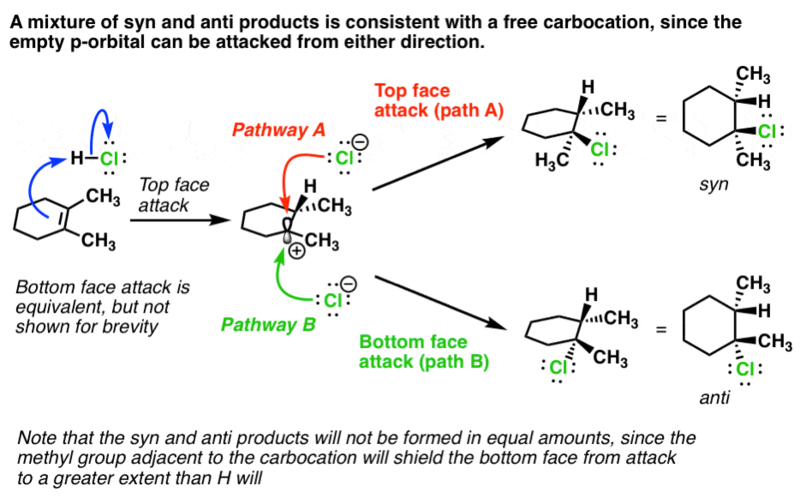 Note that in the above reaction, the two faces of this carbocation are not precisely equal. The bottom face is shielded by the methyl group adjacent to the carbocation, which occupies more space than the corresponding hydrogen on the top face. Therefore we should expect (and in fact do observe) more of the syn product relative to the anti product. However, both products are still observed. Rearrangements. Rearrangements can occur in situations where a hydride or alkyl shift can lead to a more stable carbocation. More on this in a subsequent post (this is getting long) but for similar examples, see the posts on rearrangements in substitution and elimination reactions. With these facts in mind, and having proposed this new hypothesis, we can now propose a rephrasing of Markovnikov’s rule. In its previous incarnation, Markovnikov’s rule sounds pretty arbitrary (H adds to the carbon with the most hydrogens? Why?). In this rephrasing, we can say exactly why these reactions proceed this way. In the reaction of alkenes with hydrogen halides, the reaction will proceed through the most stable carbocation. As we’ll see this will not only apply to the reaction of alkenes with hydrogen halides but also with acid in the presence of other nucleophiles (like water and alcohols). One last note. If you look above, for the first time we’re using the arrow pushing formalism to show electrons flowing from a π bond to form a new sigma bond. In other words, it’s acting as a nucleophile! This arrow might look a little weird. In the next post we’ll explore this in a little more detail. Looking forward to your next post about hydride and/or alkyl shifts. The first time I saw them in the textbook, I was so confused. If you were to look at this from a redox perspective, would you say the alkene is being reduced by the HCl? If so, would you say the HCl is oxidized? the second part is confusing. Well, one carbon of the alkene is forming C-H (and therefore reduced). One carbon of the alkene is forming C-Cl (and therefore oxidized). On a *net* basis, the alkene is not being reduced or oxidized, even though the individual carbons are. As for HCl, let’s look. The hydrogen goes from being bonded to Cl to being bonded to C (no change in oxidation state of H). The chlorine goes from being bonded to H to being bonded to C (no change in oxidation state of Cl). An alkene reacting with Br2 or Cl2 would technically be oxidized. One carbon is being oxidized (trading a C-C bond for a C-Cl bond) and the other carbon is being reduced (trading a C-C bond for a C-H bond). Net, it is not an oxidation. In the picture where you first discuss a possible “hypothesis” mechanism for the reaction, you have a typo in your bond list. The bond being formed in Step C should be C-Cl not H-Cl, yes? Thanks a lot especially for the sterochemistry part most books and other materials never touch on it and we had a question in our test and i got confused with sterospecificity of the reaction. Thanks for making it crystal clear. I love your articles they make chemistry so easy. Looking forward for your next topic. Yes, the stereochemistry falls into a few key patterns and once you learn the patterns, it’s fairly straightforward. Your article is excellent. I am very much impressed and inspired. Thanks. I am glad you found it helpful, yogesh. When neither new substituent added is a hydrogen (e.g., halohydrin formation), how do you determine which of the two needs to be on the more substituted carbon for the molecule to be considered “Markovnikov”? Is it always the one that acted as the nucleophile in the mechanism (or is there some kind of priority based on atomic number or electronegativity instead)? Thanks Bo, I appreciate it. Regarding your question, it’s the species that acts as the nucleophile. That’s it. There is *one* exception, if you want to split hairs, and that’s hydroboration. It’s called “anti-Markovnikov” in that it gives the “anti-Marknovnikov” product of hydration of an alkene, even though it doesn’t pass through a carbocation.